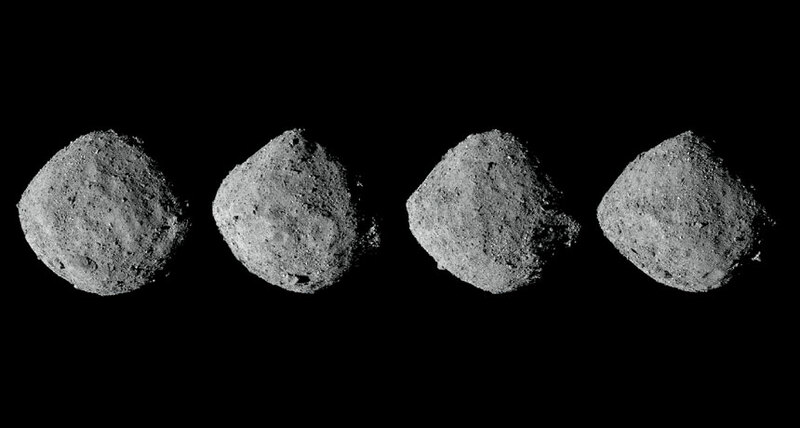 THE WOODLANDS, Texas — Like the “Peanuts” character Pigpen, the near-Earth asteroid Bennu moves around in a cloud of its own dust. NASA’s OSIRIS-REx spacecraft has watched Bennu spit out plumes of dust 11 times since the spacecraft arrived at the asteroid in December 2018. And some of that dust is caught in orbit around the asteroid, scientists announced March 19 at the Lunar and Planetary Science Conference. It’s the first time astronomers have spotted such activity at an asteroid. OSIRIS-REx arrived at the near-Earth asteroid on December 3, when the rock was about 130 million kilometers away from Earth (SN Online: 12/3/18). To the team’s surprise, OSIRIS-REx’s navigation cameras picked up several bright spots floating near the asteroid on January 6. Analyzing the spots revealed that they were eruptions of dust particles from Bennu’s surface. The particles were ejected at speeds between a few centimeters per second and 3 meters per second. Some of the dust is flying off into space, but some is getting caught in orbit around Bennu, Lauretta said. The team saw 11 separate plumes from January 6 to February 18. “I’m amazed,” says planetary scientist William McKinnon of Washington University in St. Louis, who is not part of the OSIRIS-REx team. “I’ve never heard of this before. That’s the coolest thing so far.” Lauretta and colleagues aren’t sure what causes the plumes. One idea is that Bennu’s subsurface contains volatile gases, which escape from the rock as the sun heats them up and push out plumes of dust in the process. If so, Bennu may have reached near-Earth space relatively recently, though it’s unclear exactly when. Because the asteroid was likely born further from the sun in the asteroid belt between Mars and Jupiter, it probably would have lost those volatiles had it wandered into the inner solar system a long time ago, the scientists say. The team doesn’t think that the dust poses a danger to the spacecraft. But Bennu’s surface might.